Even if you have impeccable dental hygiene, the foods that you eat can undo all of your hard work. However, there are foods out there that can actually help your teeth stay strong. With that in mind, we’ve gathered the best and worst foods for your teeth. If you notice any foods that you eat regularly show up on the worst list, it might be a good time to reconsider their placement in your diet. To ensure you have healthy teeth and gums for years to come, it’s important that you visit your dentist regularly. For the Glenn Mills area, Brandywine Smile Center is your go-to dental practice, specializing in general dentistry, laser dentistry, teeth whitening, and much more. 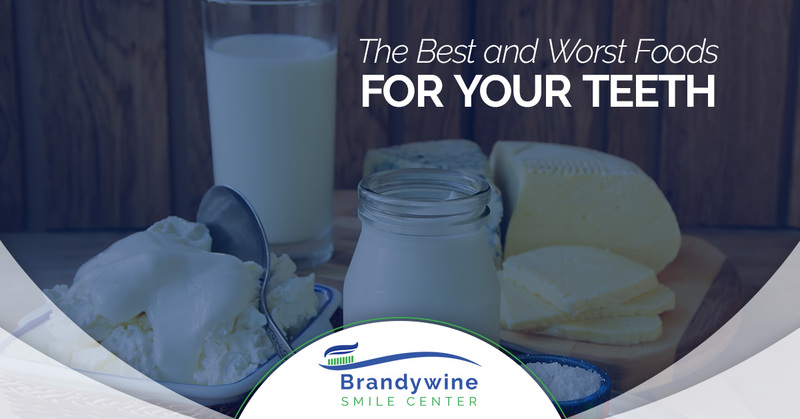 Dairy products like cheese, milk, and plain yogurt contain calcium, phosphates, and vitamin D, which are important to maintain the health of your teeth. That is because teeth are comprised mostly of calcium. When your diet is lacking in calcium and other important minerals, you’re at far greater risk of tooth decay and other issues. Another benefit is that the calcium contained in these foods mixes with plaque and sticks to teeth. This creates a protective barrier against acids that cause tooth decay while rebuilding tooth enamel. If you are lactose intolerant or otherwise allergic to dairy products, there are many juices fortified with calcium, along with soy milk and other foods that contain as much calcium as milk would. If you finish off a meal with a piece of cheese or a glass of milk, they can cancel out the acids you ate in your dinner. When you chew sugarless gum after a meal or snack, it can stimulate your saliva to wash away harmful acids off of your teeth, preserving your tooth enamel. However, this will only have the desired effect if it is sugarless, as gum with sugar will increase your risk of developing cavities. On the other side, sugar-free gum made with xylitol has shown decay-preventive properties, along with an unexpected benefit. Research has shown xylitol can inhibit the growth of Streptococcus mutans, which is an oral bacteria that causes cavities. Tea is made up of compounds that suppress bacteria, which helps to prevent tooth decay and gum diseases like gingivitis. The water you use to brew your tea may also contain fluoride, which provides added protection for your teeth. However, it is important to remember not to add sugar to your tea so you can avoid cavities. Any water containing fluoride, or products made with fluoridated water, helps your teeth. This can include everything from powdered juices to dehydrated soups. If fluoridated tap water is not available in your area, you can ask your dentist about fluoride supplements. You likely know by now that sugar and candy cause many cavities to develop. However, this is especially the case with candies that stay in your mouth for extended periods of time. Suckers, caramels, jelly beans, and hard candies make it much more difficult for your saliva to wash the sugar away, leaving it to rot away at your teeth. Sweets like cookies and cakes, while still containing cavity-causing sugar, are easier for saliva to wash away. With that said, it is important you limit when and how much you eat them as if they are eaten throughout the day the buildup of sugar will be more difficult to clean out of your mouth. Though much of the education when it comes to foods you should avoid is focused on sugary sweets, foods like chips, bread, pasta, and crackers can be just as harmful to your teeth as candy. These starches made from white flour are simple carbs which can linger in your mouth. When starches break down, they turn into simple sugars, which become food for the bacteria in your mouth. When bacteria eat those sugars, they produce acid which results in tooth decay. The name “soft drinks” is a bit of a misnomer, considering how hard they are on your teeth. Not only do they contain high levels of cavity-causing sugar, both regular and diet sodas contain phosphorus and carbonation, which wears away the enamel on your teeth. When your enamel is worn down, your teeth will become stained and brown or yellow. This doesn’t stop with just sodas, though. Most energy drinks, bottled iced teas, and lemonades also contain large amounts of sugar and acidity that will wear away your tooth enamel. If you drink soda on a consistent basis, you can use a straw to prevent it from coming into too much contact with your teeth. While fruit is an incredibly important part of everyone’s diet, fruit juice can cause trouble for your teeth. Whole fruit contains fiber and small amounts of natural sugar. In contrast, fruit juices often contain a minimal amount of actual fruit juice and excessive amounts of added sugars, which are incredibly damaging to your teeth. If you regularly drink fruit juices, try making them at home with your own blender or juicer to ensure you’re getting as much juice as possible without the added sugar. Similar to sodas, if you’re unable to make your own at home, you can drink fruit juices with a straw to minimize the contact with your teeth. Foods and drinks high in acidity are incredibly harmful to your teeth when they are left in contact with them for extended periods of time. Acid rots away your enamel, weakening your teeth and leaving you at risk of cavities and other damage. You will also see an increase in staining as the enamel gives way to the yellow dentine contained below. Avoid keeping foods like lemons, limes, or other highly acidic items in your mouth for a long period of time to lessen the damage they can cause. Another helpful hint to minimize damage to your enamel is to wait at least an hour after you’ve eaten to brush your teeth, especially following a meal with acidic foods or drinks, as they soften your enamel and make your teeth more prone to be damaged by your toothbrush. For more information on how you can keep your teeth healthy and strong, keep an eye on this blog. We’ll be detailing even more helpful information to aid you in your quest for a smile you can be proud of. If you’re in the Glen Mills area and you’re looking for a skilled and trustworthy family dentist, come to Brandywine Smile Center. No matter if you’re looking to whiten your teeth, improve your oral health, or just need a checkup, the dentists at Brandywine are here for you. We hope to see you soon!